TJC does not have an admissions test. However, all incoming students are required to take the TSI Assessment or an approved alternative test for all non-exempt students prior to enrolling in college-level courses at TJC. Some students may be exempt from taking the TSI based on SAT, ACT, TAKS or STAAR tests, their major, as well as other factors such as military veterans or those with an associate degree or higher. A full list of exemptions can be found here. Did you take the TSI at another institution? We need your results for your student records! Don't worry, we'll do the hard work. Just tell us where you took the test and we'll go fetch your scores. If you're only taking one or two sections of the TSI, we've reduced the price! What is the TSI test? Take the TSI test at your high school and the scores will be sent with your official transcript. Take the TSI test online at home by using our remote proctoring system. Come to TJC during testing center hours and your scores will automatically be entered into our system. Come to one of our Fast Track events during the summer to take the TSI and be advised for fall classes. Click here to RSVP. For several weekends during the summer we'll be open for students to take the TSI. Click here to RSVP. The TSI test is required for all incoming TJC students unless you are exempt. When can I take the TSI at TJC? Monday - Thursday between 8 a.m. and 4 p.m.
Friday between 8 a.m. and 1 p.m.
Saturday between 8 a.m. and 11 a.m.
What if I believe I am exempt? If you have taken the TSI at another school or institution, please let us know by filling out this form. What can I expect from the TSI exam? The TSI exam is composed of three subjects: writing, reading, and math. The TSI Assessment is not a timed test. The average time to complete all 3 sections of the test is 3–5 hours. The TSI assessment’s writing section is composed of two subsections: an essay and multiple choice. The other sections are multiple choice. What do my TSI scores mean? The TSI test is not a pass/fail test. The TSI test results are an indicator for types of courses you can enroll in at TJC. If you place below the scores in the chart below you may need to enroll in non-credit developmental classes before taking college-level courses. When do I take the pre-assessment? Before you take the TSI, you must participate in the Pre-Assessment Activity (it's the law!). You will not be allowed to take the TSI until you have completed this activity. Can I retake the TSI? Yes. You may retest at any time. How much does it cost to take the TSI at TJC? What should I bring with me to the testing center on the day of the test? How should I study for the TSI exam? It is highly recommended that you prepare for the TSI, so the exams accurately reflect your placement in reading, writing, English, and mathematics. 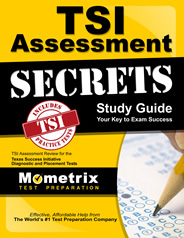 Follow the sample questions and study guide below before you complete the TSI pre-assessment.